When a juror decides that the defense is right, he turns blue. A red juror means he has decided the prosecution's version of the facts is correct. Convince seven jurors (out of twelve) and you win the case. A mistrial (six-six) can also result. Score points on your turn when you successfully object. Your opponent scores when your objection is overruled, or you fail to object to testimony (admissible). 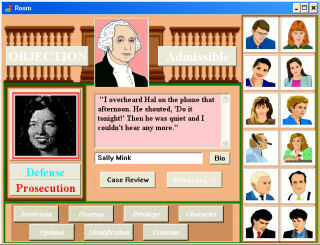 Select a witness from the witness pool (another screen), then he will appear in the witness box. He or she is identified as a defense or prosecution witness. Each piece of testimony appears so you can evaluate it at length. Objectionable or Admissible? On what grounds? Hearsay? Irrelevant? Authentic? Privileged...? If you have objected to testimony, then next choose the grounds -- Irrelevant, Immaterial, Hearsay, Opinion, etc. Each case presents eight witnesses -- four defense and four prosecution. A variety of lifelike characters in black and white or color grpahicss are used throughout Courtroom for presentation of realistic pictures and scenes. 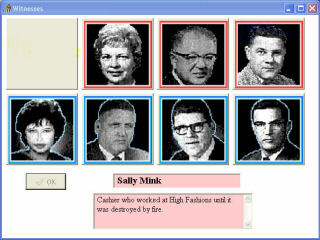 One option shows you a synopsis of the case. 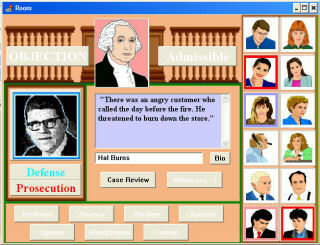 Another option presents a brief sketch of the relationship of each witness to the crime or defendant. You can also choose from liberal or conservative judges. Requires only 8 Megabytes storage space, runs on Windows 95, 98, 2000, XP, Vista and Windows 7. Sorry, only Windows version available at this time. Linux version to arrive soon.